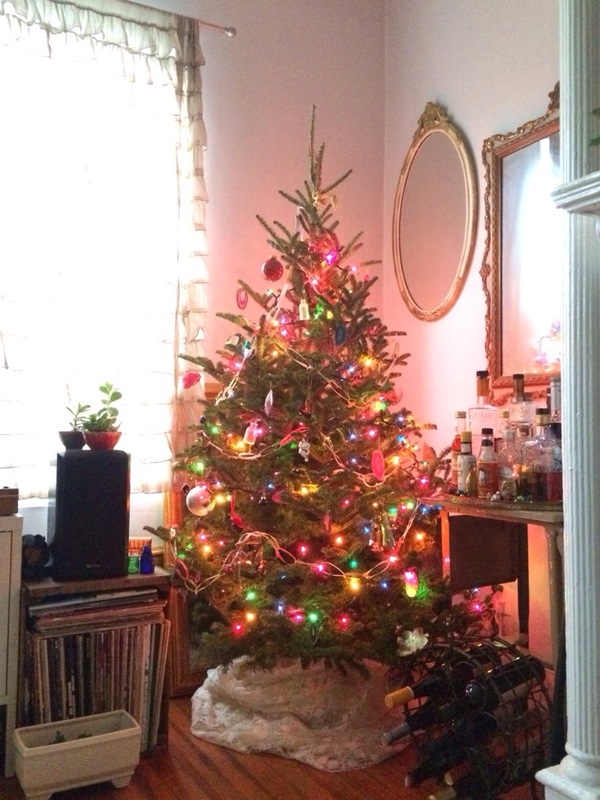 For the past 4 years, my husband and I have purchases a baby sized Christmas tree, which we would ceremoniously decorate together in our tiny 380 square foot apartment. But this year we live in a new apartment that is almost twice as big as our last one so we got a tree that was twice as big! So without further adieu I present to you our average sized Christmas tree featuring our small but growing collection of ornaments and colorful lights. I also made a ribbon chain using gold, silver, cream and neon pink ribbon, and hung some of my tiny glass bottles and agates! Still trying to figure out what to put on top of it though! With all the amazing Valentine's Day DIY tutorials I've been seeing online, I've been feeling pretty inspired to make something...but not inspired enough to go crazy and turn my living room wall into a fringe heart photobooth backdrop. More like inspired enough to make something that doesn't require me to buy anything new...and can be made during a night of watching mindless prime time TV. So this past week I grabbed a roll of parchment paper, a pair of scissors, some colored pencils, a sewing needle and string, and turned on the TV to watch the reality show disaster known as The Bachelor (my favorite show to hate-watch). This garland is easy to make, scalable (can make a little one or a super long one), and you can decorate it any way you want! I used colored pencils and some gold glitter but you could use a regular pencil or Sharpie to draw dots or stripes, and it would look equally awesome. Using the "folded paper in half/draw half a heart" technique you learned in first grade, make a heart that is about 1.5"-2" wide and tall to use as your tracer. I used a piece of scrap paper to make mine but you can use parchment paper. Take a piece of parchment paper that's about 2 feet long and scribble all over half of your paper with colored pencil, Sharpie markers, crayons, or regular old pencil. Leave the other half of the paper blank. Trace your hearts and cut them out. I suggest cutting out 17-2o hearts (I used 17 for my garland). Half of the hearts I cut out were white and the other half were scribble scrabble hearts. That way I could alternate white and red hearts in my garland! Sew two hearts together at the top corners of the heart and make a double stitch and double knot your stitch before cutting the string. I made sure all my scribble hearts were sewn on top of the white ones for consistency. After you are done sewing all your hearts together, add 8-12 inches of string on each end (attach using same double stitch technique from Step 4). I added string so that my garland was longer and it gave me more flexibility with hanging it. This last step is optional. I decided to add some sparkle to my heart. Using Mod Podge glue and superfine gold glitter, I painted some glue dots on the white hearts, painted some scribble lines on the red hearts, and sprinkled gold glitter on them. 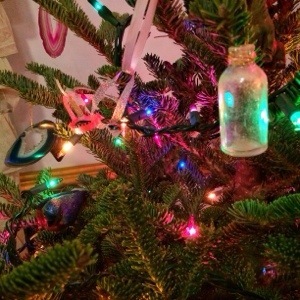 If you do add glitter with glue, make sure you sprinkle the glitter soon after you apply the glue before the glue dries! There are a few nights left of good prime time TV to make paper heart garlands before Valentine's Day so if you decide to make one please share your photos!!! I'd love to see how they turn out! You can share them by posting to my Facebook page, by emailing your picture to SparkleMotionDecor@gmail.com, tweeting your photo to @SparkleMoDecor, or pinning your photo with #SparkleMotionDecor in the caption. I hope everyone has a wonderful Valentine's Day and is able to find some time to do something or spend time with someone you love! It's all aboot the 'bout at the West Elm Chelsea Spring Social! Yesterday evening I attended the West Elm Spring Social hosted by wedding designer extraordinaire, Michelle Edgemeont, and made the cutest boutonnieres using tiny air plants and paper flowers sold at West Elm. These boutonnieres are really easy to make and a perfect DIY for anyone getting married, going to the prom, or for those in need of some floral flair to spruce up an outfit. And if you're getting married you can make these several days before your wedding. First you want to attach some floral wire to your air plant by sticking the wire through the base of the plant and twisting it (don't worry you won't hurt the plant). You then need to add the rest of your foliage and once you figure out your combination you just wrap more floral tape around it all and finish off with some ribbon (this last part is optional though!). And don't forget to trim the wire - the boutonniere's base only needs to be a few inches long. If you are making these for your wedding I suggest you make a few test ones to see how long they last (so you know how far in advance you can make them) and if you are using real live foliage in addition to your air plant/paper flowers, you should check the life span of said foliage since some are more durable than others. If anyone tries making one of these please share your pics!